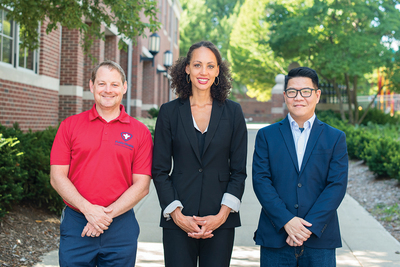 The Identifying Depression through Early Assessment Women’s Health Coalition is led by, from left, Brandon Meline, the director of maternal and child health with the Champaign-Urbana Public Health District; and University of Illinois professors Karen M. Tabb Dina, social work; and Wenhao (David) Huang, education policy, organization and leadership. CHAMPAIGN, Ill. — An expo, national symposium and film screening are planned in Champaign to heighten awareness of women’s mental and physical health during and after pregnancy. The film and expo are free and open to the public. The Patient Advisory Group of the Identifying Depression through Early Assessment Women’s Health Coalition is coordinating the events. The group and the IDEA coalition heighten awareness about perinatal depression and involve patients in research to improve services for women during the perinatal period. 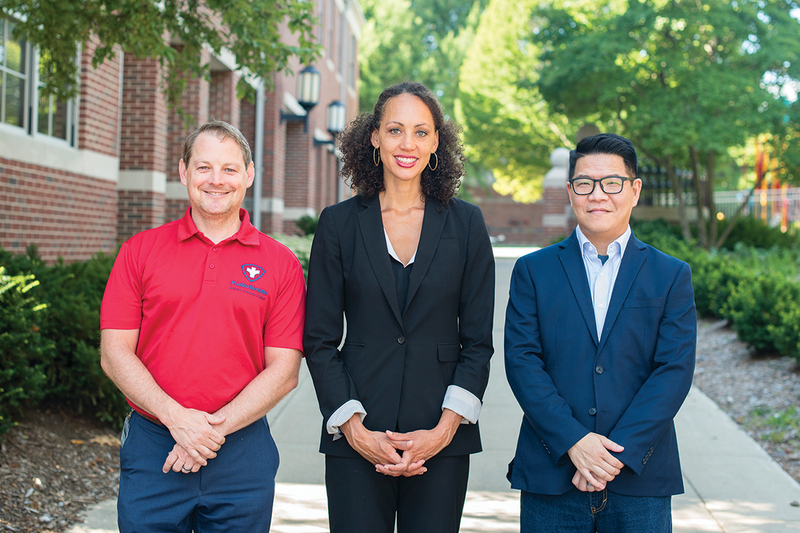 The coalition is led by University of Illinois social work professor Karen M. Tabb Dina; education policy professor Wenhao (David) Huang; and Brandon Meline, the director of maternal and child health with the Champaign-Urbana Public Health District. On March 30, a Pregnancy and Postpartum Expo with more than 30 exhibitors will be held at the Champaign Public Library, 200 W. Green St., Champaign. The expo will be from 10 a.m.-noon in the library’s Robeson Pavilion Rooms A, B and C.
Local health care providers, doula groups, breast pump vendors and other organizations will host exhibits and provide information about their services. Door prizes will be given away. Women will talk about their personal experiences during and after pregnancy in an 11 a.m. panel discussion. On May 3-4, the inaugural National Perinatal Depression Research Engagement Symposium will convene at the I Hotel and Conference Center, 1900 S. First St., Champaign. Speakers will discuss topics such as maternal stress, mindfulness interventions, health policy related to perinatal mood and anxiety disorders, and infant mental health. Speakers from the U. of I. will include Tabb Dina, who researches perinatal depression and suicide; Huang, whose research explores the use of technology in mental health interventions; and psychology professor Heidemarie Laurent, an expert on stress regulation and parental depression. Other speakers include University of Iowa epidemiology professor Kelli Ryckman, whose most recent study examined opioid use among mothers with postpartum depression who delivered by cesarean section; and psychologist Ellen L. Poleshuck of the University of Rochester Medical Center, who researches integrated treatments for women who have depression and co-occurring problems such as pain, intimate partner violence and socioeconomic difficulties. Members of the Iowa Perinatal Health Patient Advisory Board and the IDEA Coalition Patient Advisory Board also will discuss their research. Social workers and counselors can earn eight continuing education units for participating in the symposium; the symposium registration fee for CEU credit is $75. Registration fees are $50 for researchers and health care providers, and $20 for patients, students and community members. Register online at http://socialwork.illinois.edu/pd_research/. On May 21, a film screening will be held to raise awareness about disparities in maternal mental health. The film “Unnatural Causes” will begin at 7 p.m. in Robeson Pavilion Rooms A-B at the Champaign Public Library. The Patient-Centered Outcomes Research Institute is funding and co-sponsoring the events with the Champaign-Urbana Public Health District, the IDEA Coalition and the U. of I. School of Social Work. The advocacy group Postpartum Support International designated May to be National Maternal Depression Awareness Month. Up to 10 percent of women experience anxiety or depression during pregnancy, and as many as one in seven moms and one in 10 dads experience postpartum depression, according to the group’s website.